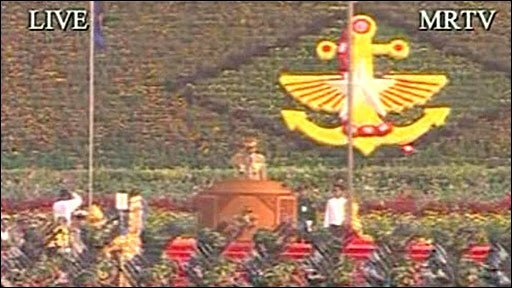 Thousands of soldiers have taken part in Burma's annual Armed Forces Day parade in the capital Nay Pyi Taw. Military ruler General Than Shwe inspected the troops and gave an address to the crowds at this rare public appearance. The parade was the last before elections later this year which should replace Burma's military government. However, critics say the military is aiming to keep power even after the elections. Lines of troops paraded past their commander-in-chief, pledging their allegiance to the nation and to senior general Than Shwe. He is the centre of power in Burma; it was his decision to move the capital here to Nay Pyi Taw and build this lavish city with its broad avenues and luxurious ministries on what a few years ago was just scrubland. When the election takes place will be his decision too. The election laws have been criticised around the world and by opposition groups here for being anything but free and fair. But after many years without change, others hope it might at least be a step towards helping the millions who live here in poverty. No date for the poll has yet been set. There has been speculation that Than Shwe will want to remain as army chief or may try to become president. In his speech, Than Shwe referred to the elections, which he said would be free and fair. He issued a warning to what he called external powers saying that during transition to an unfamiliar system, countries with greater experience usually interfere and take advantage for their own interests. He warned of "inappropriate" campaigning by opposition groups and said the nation would be strong "only when the armed forces are strong". The BBC's Alastair Leithead, who was among foreign journalists invited to the parade, said the event was a clear message of the strength the Burmese military has - and is not prepared to give up. Burma recently revealed new laws under which the multi-party elections will take place. Many key opposition figures - including detained leader Aung San Suu Kyi - are not allowed to take part. Members of religious orders are also banned from taking part, a rule which covers the monks who led anti-government protests two years ago.